Describe the structure of financial systems with financial markets, securities and financial intermediaries. 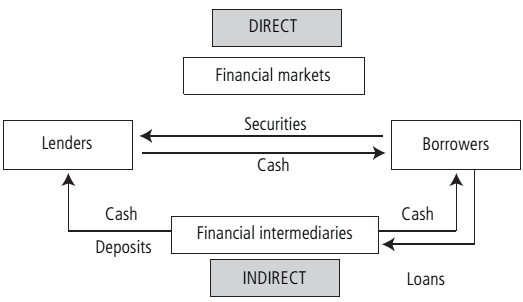 By a structural point of view a financial system can be considered in terms of the entities which compose the system. A financial system includes financial markets, financial intermediaries and securities. Financial markets are markets wherein funds are moved by people who have an excess of accessible funds and have lack of investment opportunities to people who have investment opportunities and have lack of funds. It also has directly effects onto personal wealth and the behaviours of consumers and businesses. Thus, they contribute to increase the production and the efficiency into the overall economy. Financial markets as like bond and stock markets are markets wherein securities are traded. Securities also termed as financial instruments are financial claims onto the issuer’s future assets or income. They represent financial liabilities for the individual or firm who sells them as borrower or issuer of the financial claim into return for money and financial resources for the buyer as lender or investor into the financial claim. From definition, hence, the sum of financial assets into existence will precisely equal the sum of liabilities. Governments and corporations increase funds to finance their activities by giving equity instruments (shares, identified in the USA as stocks) and debt instruments (bonds). Bonds are securities which promise to make periodic payments of a sum of money for a given period of time. Stocks are securities which represent a share of ownership into the firm. Financial intermediaries are economic agents who specialise within the activities of selling and buying (at similar time) financial contracts (loans and deposits) and securities (stocks and bonds). Remember that financial securities are simply marketable, whereas financial contracts cannot be simply sold (marketed). Banks by the largest financial institution into our economy that they accept deposits (loans from individuals or firms to banks) and create loans (sums of money lent by banks to ones or firms): thus, they borrow deposits through people who have saved and into turn make loans to the others. In present years, other financial intermediaries, as like mutual funds, pension funds, investment banks and insurance companies, have been growing at the expense of banks. A bondholder buys a bond maturing in two years for Rs. 120 and earns Rs.15 per annum as interest. His YTM is ______ %. Determine the Present Value of An Annuity and give explanation of this topic????? Bank draft, what is bank draft?How it can be prepared? what is bank draft?How it can be prepared? Please describe the trade-off theory of capital structure and how it vary from the Modigliani and Miller theorem with taxes. OPTION, DEFINE THE TERM OPTION IN DETAIL? DEFINE THE TERM OPTION IN DETAIL?